The Cycle Show, the UK's national showcase for all the latest bikes and shiny new cycling kit, has announced that two of the sport's biggest stars will be appearing at this year's edition taking place at the NEC Birmingham in September. 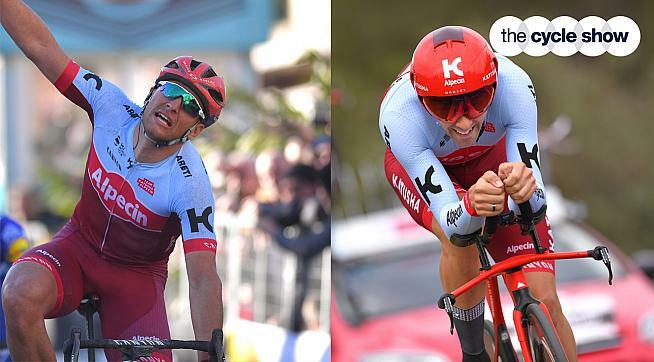 German sprinter Marcel Kittel and British TT specialist Alex Dowsett will be on hand to meet visitors at the Canyon Bikes stand on Saturday 29th and Sunday 30th September. Marcel Kittel, one of the fastest sprinters in the world and with 19 Grand Tour stage wins to his name, is one of the most decorated German sprinters of all time and the only German to have worn every jersey at the Tour de France and Giro D'Italia. Alex Dowsett has remained a true time-trial specialist since his formative year in the British Olympic Academy, and went on to win Gold at the Commonwealth Games in 2014, and break the hour record in May 2015. The Katusha team mates are in the UK to take part in this year's Tour of Britain race. Visitors will be able to put their questions to Marcel and Alex when they appear on the Main Stage, and VIP ticket holders will have the opportunity to rub shoulders with both riders in the VIP Lounge for signings and photos. Taking place at the NEC Birmingham between 28th and 30th September, The Cycle Show offers an unbeatable chance for the public to get a first glimpse at the latest 2019 bike models from the leading brands. With free test tracks featuring the latest road bikes, MTBs, electric and kids bike, visitors will have the option to 'try before they buy' while benefiting from special show offers on the most innovative cycling gear, accessories and kit. Star turns aside, The Cycle Show offers something for cycling fans of all ages and persuasions, from guest speakers on the Main Stage to test tracks and skills workshops. For families with kids, there will be two kids tracks to get youngsters riding. One of Europe's leading bike manufacturer's, Cube have ploughed all their expertise into a range of kids' bikes to enthrall, delight and build their skills, whatever their age and experience. Islabikes are also providing a full fleet of lightweight, proportionately designed children's bikes racked up and available to test ride on The Islabikes Kids Track. For slightly higher-octane thrills, the Extreme Bike Battle will provide a chance to see adrenaline fuelled, jaw-dropping stunts from across the BMX and MTB world - with the UK's #1 BMX ranked rider Lee Musselwhite on hand to show kids how to master the BMX. Elsewhere, the ebike zone will showcase the latest brands shaping the future of electric bikes and for those new to the cycling world, New2Cycling Hub in partnership with free2cycle will provide all the help, advice and know-how you need to increase confidence and enjoyment of cycling. Free to use, with regular demos, talks and advice throughout all three days, the New2Cycling Hub will be the perfect place to learn more about cycling, or start your journey into the world of cycling. The show is a great day out for the cycling fans, whether you are a pro, a newbie or somewhere in between. For full details of the programme and to purchase tickets, please visit cycleshow.co.uk.